I'm guessing I was about 6 years old when I first became aware of these talking apes. 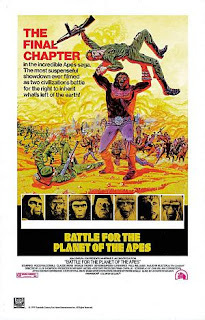 The film that opened my eyes to this world was Battle for the Planet of the Apes (1973), which to me at the time must have been the greatest film I'd ever seen. But as an adult, I now consider this fourth sequel to be the worst in the series, but it's still better than many of the blockbuster films that fill the theatres every summer. Made with a much smaller budget than any of the previous films, Battle for the Planet of the Apes is the final chapter in the Apes saga, taking place 10 years after the events from the previous film in the series, Conquest of the Planet of the Apes (1972). In Battle, the simian leader Caesar (Roddy McDowall) wants the ruling apes and enslaved humans to live in peace. But the gorilla faction--led by General Aldo--wants to keep the humans captive, and kill off the remaining mutated survivors who live within the forbidden zone (a bombed-out New York City). 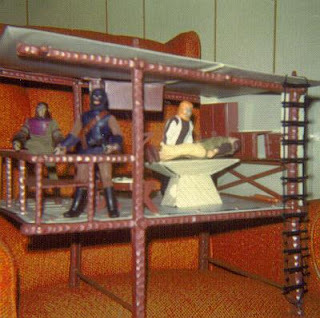 My obsession with the talking apes didn't end with the film franchise. Soon after, the short-lived TV series captured my attention. 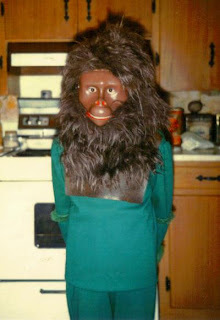 Then, in 1976, I desperately wanted to dress up as an ape for Halloween. My mom, who for years had made Halloween costumes from scratch for all her kids, probably thought she faced her biggest challenge yet (I must have approached her with a picture of Cornelius and asked, "can you make this for me?"). At the time, I believe only the plastic mask itself was available for purchase in stores. But boy, did she build on that! She bought all the material separately, and sewed together a fine chimpanzee outfit for me, complete with a furry mane to complement the mask. The mask itself was in three parts: the plastic face, a beard of sorts that had an elastic band holding it up over the ears, and a headpiece that sat on top. Such an elaborate construction! She actually made two of them--one was for her, because we often dressed up in similar costumes. Not many mothers would do that, I tell ya! I can't seem to get enough of the apes. Fitting, then, that I just picked up the Planet of the Apes 40th Anniversary Collection on Blu-ray. It offers all 5 films, including the uncut versions of both Conquest and Battle. It comes with a book with tons of background on the movies... all in all, a great deal for the money. For those interested in picking up the collection, be aware of two things: first, the packaging is unfortunately designed in such a way that you have to literally bend the DVDs in order to release them from the housing, so be careful. Once you wrestle them free from the grip of the packaging, I suggest you keep them in sleeves for easier access later on. And secondly, there is an annoying introduction from a poorly-animated Lawgiver on each disc. I can't understand how someone thought this was a good idea.